SAM-e is a dietary supplement often taken for treatment of depression. It’s also used for joint health and improvement of arthritis. It’s a ‘methyl donor’ that exists naturally in the body; supplemental dosages simply increase those naturally occurring levels. The fact that the body produces it is the reason SAM-e is not classified as a vitamin. There’s some evidence that SAM-e could help boost natural testosterone. In this short blog article, we’ll look at that evidence and explore the possibility of taking SAM-e for testosterone. 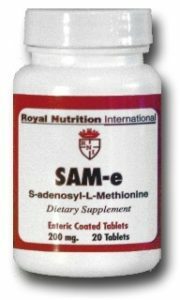 SAM-e (pronounced “Sammy”) is an abbreviation for S-adenosylmethionine. Yes, I’d prefer it didn’t sound like someone’s name. It’s strange walking into a dietary supplement store and asking for “Sammy.” The person working there usually comes back with “Sorry, we don’t have a ‘Sammy’ working here.” Of course, if there is a Sammy working there, the confusion just gets worse. Names aside, SAM-e is a methyl donor. This means that it’s a molecule that shares its ‘methyl group’ with other molecules. A methyl group, basically speaking, is a carbon atom with three hydrogen atoms attached, as shown by this simple diagram. This transmethylation pathway of SAM-e boosts dopamine, serotonin, and norepinephrine, which is likely the reason it elevates mood and helps with anxiety and depression. The transmethylation pathway is also the probable reason it has anti-inflammatory effects, reducing arthritis and joint pain. Nearly thirty years ago, some researchers wondered if this pathway could also have an effect on testosterone production. Their study was limited to in-vitro; they did their experiment on rat testes in a test tube. But this showed a positive effect via luteinizing hormone. The study revealed that when the leydig cells of rat testes were exposed to S-adenosylmethionine, the cell’s receptors became more sensitive to the signaling luteinizing hormone. This caused a greater amount of LH to attach to the receptors. It makes sense given that methylation of phospholipids is important for LH receptor transmission signals. Interestingly, there was an inverse effect in terms of dosage; as the leydig cells were exposed to lower concentrations of LH, a greater receptor sensitivity enhancement was created by the SAM-e. Even so, as exposure to LH was increased, a smaller but still relevant sensitivity improvement by the SAM-e remained. In addition, the leydig cells appeared to produce more cyclic adenosine monophosphate (cAMP) in response to the SAM-e exposure. cAMP is a secondary messenger that transfers the effects of specific hormones from the cell membrane to the inner cell. An increase in cAMP could boost testosterone a bit by itself, so it might be a bonus on top of the greater LH receptor attachment by SAM-e. Does an in-vitro study done on animal cells really mean anything? It provides nothing more than evidence of the possibility that supplemental doses of SAM-e can improve men’s testosterone. With the current absence of human studies on SAM-e for testosterone, there are too many possible variables that could negate this effect. It’s surprising that none of the manufacturers of SAM-e have funded such an experiment in the years following this test tube study. But whatever self-experimentation a guy does with SAM-e for testosterone, it should be noted that the supplement is unlikely a cure-all for ‘low T’ or male menopause. 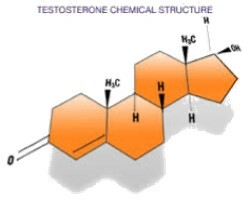 There are too many other factors, such as body composition and general health, affecting natural testosterone. This relegates SAM-e and similar supplements to one possible piece of artillery in an armory of weapons for your T-boosting offensive. Or if you prefer less military-like verbiage: Natural testosterone improvement needs to be a ‘holistic endeavor’ in order to be effective. An interesting ‘supplement stack’ might be to combine a few hundred milligrams of SAM-e with an LH stimulating supplement like mucuna pruriens or ashwaghanda. Or maybe also stacking it with forskolin (for cAMP) would be effective. A strategic combo like this along with good antioxidant defense against lipid peroxidation might produce positive results over time. Important Note: Just make sure you consult your personal MD before using SAM-e or any other dietary supplement. This stuff can have powerful effects in combination with specific medications, other supplements, or just one’s individual health makeup.